As I was standing in line for Penance, I glanced at the front of the line. 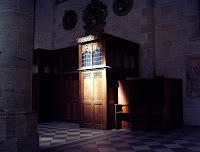 A mother was guiding her young son into the confessional. She said something to the priest, and I heard him exclaim, "It's his first time, is it? ", then to the boy "Hi there! Have a seat!" As the boy sat down, the mother slowly backed out and started to close the door. "Oh, you can keep that open, thank you," the priest said to the woman. She left the door open and stepped to the side, out of view. 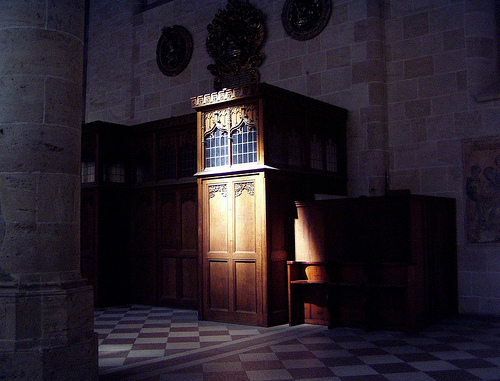 As the confession began, and I heard the reassuring tone of the priest, I smiled. "What a considerate priest," I said to myself. "He left the door open so the kid could see his mom if he got nervous." As I returned to preparing my thoughts, I got a pit in my stomach the size of a basketball. I realized the priest did not leave the door open because he was being thoughtful. He left it open because he had to. He had to because a few priests did terrible things, and a blood-sucking media stereotyped an entire profession. So instead of this kid having a private confession, he shared it with everyone standing there. I stood there in disgust. That should have been a conversation between the child, the priest, and Jesus. That should have been a beautiful first Penance. That door should have been closed. How sad that this is what it has come to. We have a "Safety Coordinator"; our diocese requires one in every parish. Their job is to make sure everyone who deals with children has an up to date criminal records check. The bad apples have indeed spoiled the barrel, and the media won't let us forget it. That is sad. I wish there was another way. Maybe a window in the door? However, the good news is, the Church is probably one of the safest places today because of all it has done to try to protect the children now. If the rest of society would only work as hard at protecting children.